Fonterra's farmers say the final payout for the past dairy season of $4.65 is a "disappointing" result. The chairman of Fonterra Shareholders’ Council Duncan Coull said while it was encouraging to see the improvement in Fonterra’s performance in the second half of the season "Farmers will be disappointed with the 25 cent dividend which was at the lower end of their expectations". “Farmers had an expectation the business would have been able to take greater advantage of the low Milk Price environment. “The Board and management have given us an undertaking that they have a strategy in place to address this and the expectation from Council is that its implementation will give effect to the turnaround required," Coull said. Fonterra has massively boosted its forecast milk price to farmer suppliers for the current season, giving an estimate of a $4.60 return per kilogram of milk solids, up from a previous pick of just $3.85 made as recently as last month. The increased pick by Fonterra comes on the back of a resurgence in global dairy prices in recent weeks. However, Fonterra also updated and revised down its prediction of milk production, having earlier forecast a drop of 2-3% on last season's output. Chairman John Wilson said the co-operative was now picking a drop of "more than 5%" in the current season. “We are 5% behind last season to date and are currently tracking 8% down on last season on a weekly basis. Farmers are responding to the tough economic conditions and with cow numbers down, less supplements being fed and challenging weather conditions for much of the country..."
The giant dairy co-operative has also today re-affirmed a milk price of $4.40 for the past season, and a dividend of 25c, which is right in the middle of the forecast range of 20-30c - though that forecast was trimmed back at the half-year point from an early forecast of 25c-35c. The New Zealand dollar rose by about quarter of a cent against its American counterpart shortly after the results came out at 8.30am, and it has continued to rise, currently up about half a cent for the day at a little under US63c. Fonterra has recently announced that it is cutting 750 jobs as part of restructuring. Asked about this today, chief executive Theo Spierings indicated there would be no further substantial cuts. The company has recently cut back the amounts of, particularly milk powder, it is making available through the GlobalDairyTrade auctions. Asked about this today Spierings said it was selling the product withdrawn from the auctions through "other channels" and he said it was not being stockpiled. Wilson conceded that a milk price in the $4 range was unsustainable for farmers and something around the $6 mark was what was needed. ASB chief economist Nick Tuffley said the ASB economists continue to expect that the milk price paid to farmers this season will end up at $5.00/kg. "But at this point in the season it is a mild but positive surprise that Fonterra has revised up its outlook as far as it has." ASB had previously picked a 5% drop in national milk production and Tuffley said Fonterra's changed production guidance today was "mainly endorsing other views on dairy prices and production". "The recent improvement in dairy prices is a key reason the [Reserve Bank] may choose to pause [from cutting the Official Cash Rate] in October (we are still picking an October cut but it is a lineball call). "The production fall is, however, going to drag on economic growth." Westpac senior economist Satish Ranchhod said that while the new forecast milk price was still below the break-even level for many farmers, the increase would "come as a welcome relief for many in the dairying sector". "Compared to Fonterra's previous payout forecast, today's announcement implies an increase in revenue of around $1bn over the coming year." Ranchhod said Westpac economists' own current forecast for the 2015/16 milk price was $4.30, "but with global dairy prices up nearly 50% from their recent lows, the risks to this clearly lie to the upside (we will formally review our forecast after next week's dairy auction)". "This is a key reason why we expect the Reserve Bank will decide to keep the OCR on hold at its October meeting before resuming cuts in December." Is this reason to raise domestic bank funding costs to retain more money within the consuming NZ.community, rather than watch it exported to Australia as profit. Not a chance -right? I'm picking this will go down badly amongst farmers who culled significant numbers of cows when Fonterra announced the $3.85 payout, despite the fact that Fonterra were making massive profits, not to mention all the farmers who committed suicide. Fonterra - Farmers, no separation as they are a Co-OP working together. Farmers are in control but you would not think it.The backlash this company receives is truly astounding! Knowing what they do behind the background to SUPPORT farmers. Harden up and stop moaning, any other company reporting net profit after tax up to $506 million, up 183 per cent would be meet with applause. What does it take to make you guys crack a smile? A never ending supply of cheap credit to capitalise the interest cost on already over mortgaged production property. How's that for starters? I could elaborate at a price. I don't think things look that good. The $500 million profit is only $261 million comprehensive income, equity is still lower than at the 1st August 2013, and intangible assets are up by nearly $500 million. Farmers in control of Fonterra - that is the Joke of the Day. Anyone BUT farmers are in control of Fonterra. 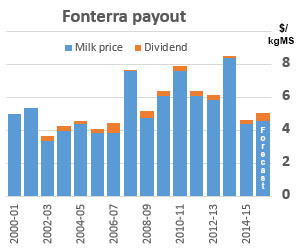 Until recently if the payout was going to change by 30cents or more Fonterra advised the market (and it's farmers). Farmers could then make adjustments to their business management. The question was asked of Wilson why they don't do that anymore, so that farmers can alter their management etc earlier. Answer: We don't want our competitors to know where we are at. So it was ok to advise farmers previously, but not now. Pull the other one. Actually Frazz we don't need to applaud their 'turnaround' this season - not after the previous abysmal losses in Australia. It is what should have been expected. Looks like the secret is to pay the CEO more, higher payouts naturally follow, think what he could do if you doubled his salary? "However, it wasn't all good news. Fonterra updated its prediction of milk production, having earlier forecast a drop of 2-3% on last season's output." An even bigger 5% drop is great news, the world is awash with the damn stuff we want less not more. Note they are still forecasting around 10% less than most others. We're about 10% behind last year, no change in cow numbers and still strictly grass only, due simply to a poor Autumn and even slower Spring. Still struggling to grow more than 40kgsDm/day when we need 55plus. Agree Red Cows. Further justified that our (Fonterras) million dollar executives finally waking up to the basic fundamental fact that milk derived from pasture is superior and in greater demand, to that of non pasture (TMR, concentrates). Therefore less production, but higher value...surely. Of course we will probably get a paid extra to reflect this, just like the organic guys and girls get paid three times the ordinary price because their end products are worth that (as recently stated by Fonterra ). Not. I really think it may be time to visit the way we are paid. The protein plus fat minus volume has been used for 30 odd years and there is now way more to it than that. Does this also mean that Fonterra will object to GMOs and Fed Farmers will finally wake up and see that no matter the science we are better off maintaining our point of difference? Not a very profitable business is it? If a 3% margin is all that can be achieved capital is best allocated elsewhere. And this country is supposed to be the one of the most efficient producers of dairy products. This is the same Board who are now minus Ralph Norris,he saw the light,that started last season at $7.00,then $5.25 for six months to finish up at $4.40.I wouldn't let them,the nine the nine farmer Directors run an ice cream parlour they are disfunctional and inept,with our money.Mckinnsey is on a % of what they save.the total for this round of sackings is going to hit 1200 in the next 4 weeks.Interesting that redundacies will cost $35 mill and savings $105 mill. Theo Spiering received an 18% increase in salary, bringing his pay packet up to nearly 5mio a year. Is it not time that when a major company, some say the largest in the land, has to fire a lot of staff to maintain profit margins, so that the main profiteers can still get a substantial rise, but some the actual Producers of the profit item catch a cold, sometimes leading in death, then someone actually buying the product and the spiel, but is still being overcharged, at last years prices, should totally recognise the distortions and factors at play. Or is it a totally Cooperative decision to maintain the Futures compounded growth at the public's expense and maintain the leaderships agenda, plus fiscal well being,come what may and at any cost, even death. Or is that just a by product of today's reality?. Contracted to win at any cost.